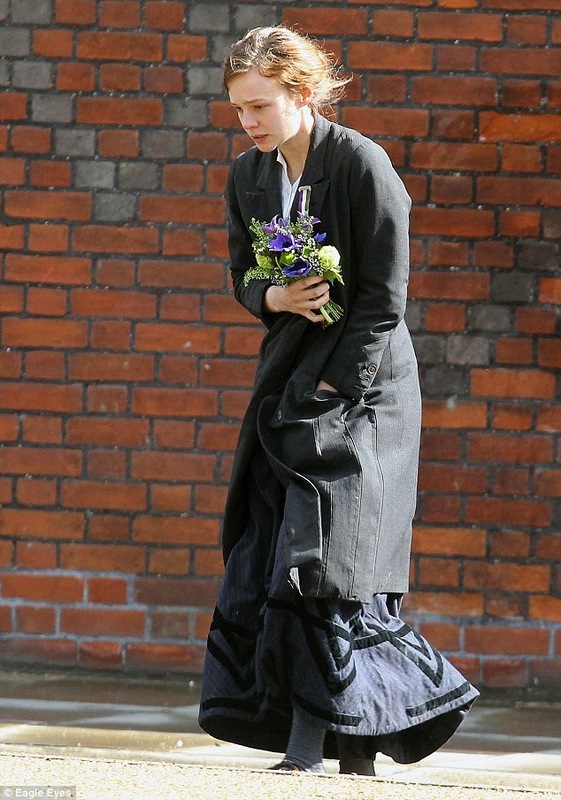 Both Carey Mulligan and Helena Bonham Carter were seen filming scenes for Suffragette at Holloway Prison near London. Emmeline Pankhurst (Meryl's character), along with close to 30 other women, was sent to that prison after leading protests in favor of women's voting rights. Poking around Oscar blogs, there are numerous people predicting Meryl having a shot at a supporting nod for this film. My understanding is that it's going to be a rather small role, mainly one important speech. I would of course love for her to be in contention, but I continue to feel that Into the Woods may be her best shot this year, and likely in lead. 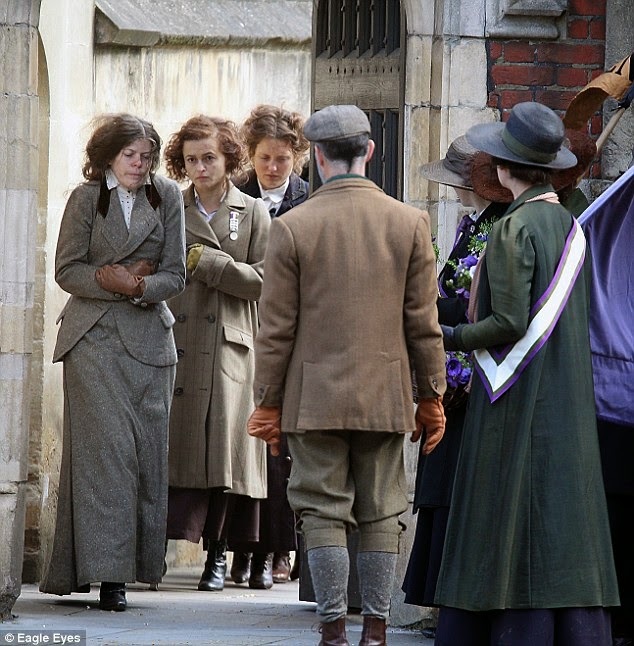 No definite word on whether Suffragette will be released in U.S. in 2014 to qualify it for awards, but as I've said in previous posts, if they're planning on releasing it in the U.K. in January 2015, I can't imagine they won't give at least a week's run here in the states to keep Oscar possibilities open. 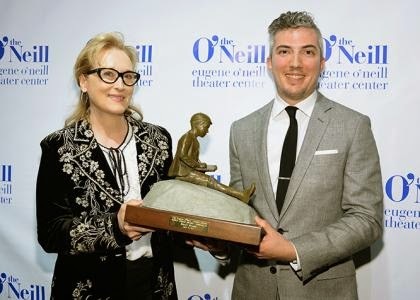 Meryl was in attendance last night in New York to receive the Eugene O'Neill Theater Center's Monte Cristo Award. Several stars joined in the gala to honor Streep for her work in theater. There are a bunch of wonderful quotes about Meryl and her work, including most her speech after accepting the award. Check out the article from The Hollywood Reporter here. A new trailer has been released for Meryl's upcoming film The Giver. The only appreciable difference I can discern from the first, aside from it being a tad shorter, is that they've included some black and white footage. I imagine it's meant to pacify the rabid purists who are worried the film may not adhere to the book exactly since everything was shown in color in the first 90-second trailer. Chill. Beginning with 2004, we begin to see Meryl in more frequent, supporting roles. A remake of the political thriller The Manchurian Candidate, directed by Jonathan Demme, modernized an Oscar-nominated role originated in 1962 by Angela Lansbury. The film earned Streep both Golden Globe and SAG nominations. Later that year, she had a small role in Lemony Snicket’s A Series of Unfortunate Events, a film which earned $209 million worldwide. I imagine Meryl may have had interest in this film due to it being based on a series of children’s books from the late 90’s, a time when she had an eight year-old in the house who was possibly a fan. 2005 requires a little fine-tuning. Some may be surprised that I’m keeping Prime, but I happen to find it a charming and funny film which ushered in a string of wonderfully effective comedic performances. To keep with my guideline of having at least one film per year either contest for awards recognition or serve some kind of direct personal or socially conscious purpose (which Prime did not), I’m left with another vacancy. In late 2004, Streep was scheduled to film All the King’s Men, another political remake, this time with a role which earned Mercedes McCambridge a Supporting Actress Academy Award for her 1949 performance. Meryl dropped out shortly before shooting began, being replaced by Patricia Clarkson. In retrospect, Streep was wise to withdraw from the project, as the film required endless editing, was pushed back to a 2006 release date, and ended up being a decided failure critically and commercially. One can’t help but wonder how the quality of this film may have changed provided a more seasoned director and appropriate cast, suggestions of which I’ve made here. I’m leaving 2006-2009 completely untouched. During that period, Streep starred in no fewer than ten feature films. 2006 saw her in the ensemble piece A Prairie Home Companion, directed by Robert Altman in what would be his last film. My friend Steph and I happened to be extras in this film when they filmed at the Fitzgerald Theater in St. Paul, MN. With The Devil Wears Prada released shortly afterward, Streep reached new heights of popularity. The film grossed $124 million domestically and over $300 million worldwide, catapulting Meryl into a territory she had never before enjoyed. Reaching a new male audience with her role as the boss from hell, Streep had proved to be a box office juggernaut at the age of 57, picking up a Golden Globe win and SAG/Oscar nominations in the process. With supporting roles in four films that were released in 2007, one might think this was a strange encore to a highly lucrative 2006. We must remember however that any success Streep would’ve enjoyed from Prada would be realized during the time she was already shooting the films that were to be released in 2007. Dark Matter was never given a proper release due to the proximity of and similarity to the Virginia Tech massacre. In it, Streep plays a Sinophile who sponsors Chinese graduate students. I have a weird suspicion that Meryl took the role simply because she got to speak a bit of Mandarin, and what other chance would she ever have to speak an East Asian language on screen? Evening, with a June release in 2007 underwhelmed with critics and moviegoers, but it gave Streep the chance to star in a film with her daughter Mamie Gummer (playing an older version of the same character), and enjoy a great scene with the marvelous Vanessa Redgrave. The final pair of films in ‘07 saw Meryl provide more social commentary, as Rendition and Lions for Lambs both centered around U.S. relations with the Middle East. As an outspoken advocate for progressive causes, these two role choices from Meryl are not surprising, six years into a George W. Bush presidency. With the release of Mamma Mia! in 2008, the brief spell of scant box office performance turned on a dime. Streep has stated that shortly after the World Trade Center attacks of 2001, she took her daughter and some her friends to the musical on Broadway and found it pure joy. When finding herself in the position to star in a film version, she was thrilled to join. Despite mixed reviews, the film would earn Streep a Globe nod and go on to be her biggest commercial success by far, amassing a whopping $600 million in ticket sales worldwide, further establishing Meryl as a bankable draw in cinemas. Mamma Mia! was followed by an adaptation of John Patrick Shanley’s Pulitzer Prize-winning play Doubt, which secured Streep a SAG award and her fifteenth Academy Award nomination. The hits kept coming in 2009, along with the awards. Julie & Julia scored Meryl her second Golden Globe award in three years and 16th overall Oscar nomination. It’s Complicated followed, providing another Globe nomination and grossing an impressive $219 million worldwide. Ten films: five Globe nominations (two wins) and three SAG (one win), BAFTA and Oscar nominations between 2006 and 2009. Not to mention a staggering $1.4 billion in worldwide box office receipts. Streep had found a nice one-two punch of starring in a mix of lovable comedies in addition to her more customary sober dramas. By this point, Meryl was understandably due for a break. After filming was complete on It’s Complicated in August 2009, Streep wouldn’t film again until early 2011. What am I going to do about 2010? If production on It’s Complicated could’ve come together say in February 2009 instead of April, and if director Nancy Meyers hadn’t needed five months to film what appears to be a relatively “uncomplicated” production design, shooting may have reasonably wrapped by May or June. We can still leave 2010 completely free of filming if there’s a second project for Meryl to do in 2009 which could then be released in 2010. As early as 2006, it was announced that Streep was in negotiations to star alongside Anthony Hopkins in an adaptation of Jay Parini’s 1990 novel The Last Station . Meryl would’ve portrayed Countess Sofya Andreyevna Tolstaya, wife to Russian novelist Leo Tolstoy. In a 2010 interview with director Michael Hoffman, he describes how after the success of The Devil Wears Prada, Meryl was “besieged with offers” and it was difficult to find a break in her schedule. As so often happens in film production, coordinating the financial equity with the actors’ schedules can be a precarious undertaking. When the funding finally came together in the spring of 2008, Streep was unavailable and she and Hopkins were replaced by Helen Mirren and Christopher Plummer, who both went on to earn Oscar nominations for their respective roles. Imagine if the funding delay had lasted until 2009. A late summer shooting schedule may have been feasible which then makes is probable that 2010 would have a Streep film. It would’ve been nice to see Meryl work with Christopher Plummer as well, as we already have two movies with Hopkins from the early 90’s (if we assume my reimagined filmography replacements). Taking 2010 off from filming, Streep was back in February 2011 to reteam with director Phyllida Lloyd (Mamma Mia!) for The Iron Lady. Released in theaters later that year, Streep’s portrayal of former British Prime Minister Margaret Thatcher earned her Golden Globe, BAFTA and Academy Awards. In the fall of 2011 Streep joined Tommy Lee Jones to film Hope Springs, a romantic comedy which, not unlike It’s Complicated, represented and appealed to an oft overlooked demographic of viewers over 50. The film was a hit in 2012 and acquired for Streep yet another Golden Globe nomination. In early 2012 Meryl had officially signed on to star as Violet Weston in the film version of Tracy Letts’s Pulitzer Prize-winning play August: Osage County. Almost concurrently, it was announced that she was rumored to be in talks to star with Tom Hanks in Saving Mr. Banks, portraying P. L. Travers, the author of Mary Poppins. 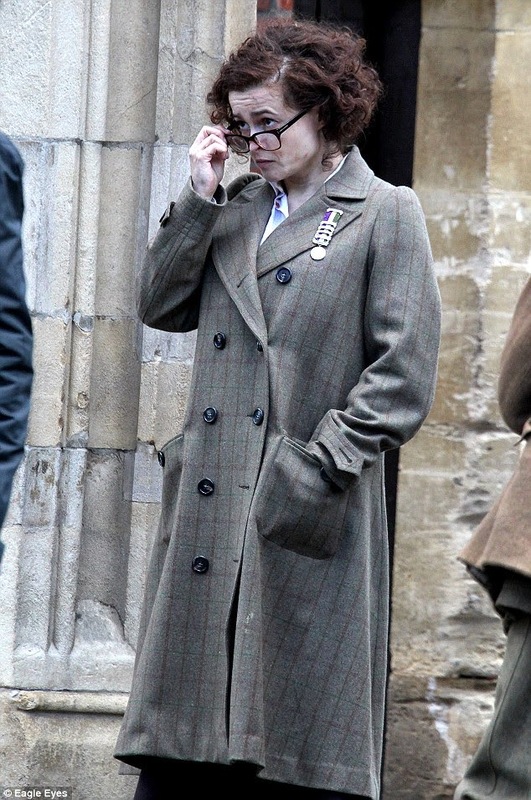 As we know, Emma Thompson took the role, and filming was underway by the time August began shooting. In the wake of Meryl recently describing Walt Disney as an anti-Semite and “gender bigot,” one wonders if Streep would’ve done the movie anyway. But perhaps portraying a strong-willed woman going toe-to-toe with Hanks on screen could’ve defied the very culture Streep felt Disney had wrongly engendered in his studio. Being a blacklisted script, Banks had been around for some time. Envision a scenario where the project came together a few months earlier, allowing for an early 2012 filming schedule. Shooting in and around Los Angeles from say March through May would certainly not make it impossible to have the picture ready for a December release of that year. Considering the fairly shaky troop of Best Actress contenders in 2012, I imagine Streep could have snuck in at the Oscars, again providing us a year which included a commercially successful comedic portrayal (Hope Springs) and a more typical Academy-friendly drama. As expected, Streep scored her 18th Oscar nomination for 2013’s August: Osage County, her most current release at the time of this posting. Upcoming in 2014 we’ll see her as The Chief Elder in the adaptation of Newbery Medal-winning book The Giver, a project which reminds me of her participation in Lemony Snicket’s a decade earlier. The Homesman, directed by and starring Tommy Lee Jones is tentatively scheduled for release in October. Streep has a bit part as Altha Carter in the 19th-century Western. Aside from getting to work with Jones again, whom Meryl has described as “infallible,” the film provides Streep the opportunity to share the screen with her daughter Grace Gummer, who also has a supporting role in the picture. Beyond 2014 we have the possibilities of The Good House, an adaptation of Ann Leary’s best-selling novel, which, if it happens, will co-star Robert De Niro. No director is yet attached, however, as the script may still be unfinished, suggesting that filming may not happen this year. Harvey Weinstein revealed in January that he’s developing a feature film starring Meryl called The Senator’s Wife, another political drama which is set to take aim at the National Rifle Association. Ricki and the Flash was just recently announced and is reportedly set to begin production this fall. Personally, I have my own wishes when it comes to what we’ll see from Meryl in the future. As the perfect vessel for cinematic portrayals, I would love nothing more than to see her in a Catherine the Great, Susan B. Anthony or Indira Gandhi biopic. How about a film adaptation of The Testament of Mary, or revamped miniseries of The Corrections? If we want to get really speculative, what about another buddy project? The blacklisted Best Actress might work with Meryl and Susan Sarandon. And if 2016 turns out the way I hope, some sort of Hillary Clinton biopic is practically an inevitability. Of course the majority (if not all) of these suggested future projects won’t happen. But I love the idea of Streep having two lead projects per year over the next half decade, with one biopic and one literary adaptation/original screenplay per calendar year. The following proposed filming schedule would finish up just before Streep’s 70th birthday. Without question Meryl would be very busy, but if these were the actual projects that came her way, I imagine she’d be up for it. I’ve proposed release dates that would not only position the films to do well at the box office, but also provide Streep with the best chance at critical and award recognition. At the time of this post however, none of the aforementioned projects (with the exception of Ricki and the Flash) are set for production. I can’t resist taking stock in the remarkable range of skills Meryl has acquired and demonstrated over the years in her screen performances. When considering only language, if we accept my reimagined filmography Streep will have either spoken or done accents in Received Pronunciation British, Polish, German, Texan, Virginian, Danish, Irish-American, Australian, Spanish, Lakota, American Sign Language, Italian, Irish, Scottish-French, Yiddish, Bronx, Cajun, Upper Midwestern, Mandarin, Boston Brahmin, Russian and Oklahoman. More tangible skills like white water rafting, horseback riding, Irish clog dancing, violin playing, French cooking, baking, and of course singing all add to the richness of her brilliant performances. Assuming Streep’s films would earn as much as they did with their original actors, the replacements and net total of three additional projects I’ve added to her career would result in a surplus of $843 million in worldwide box office returns. None of the films I’ve removed earned Streep an Oscar nomination, while seven of those I’ve added did so for the original actresses in their respective roles. Looking back at her unparalleled run of success and almost unimaginably celebrated life, with what I’ve outlined in this reimagined look at her filmography, it’s fascinating to realize how close she’s actually come to the perfect career.